The results of Faruk’s quixotic quest for a fair hearing from Shostak and mainstream science have just been released in his self-published ebook on Amazon. It pretty much strips away the myth that institutional scholars would welcome Great Taboo data if Only They Had Decent Stuff To Study. Its title is a mouthful - The Indisputable Scientific Evidence for a UFO Landing and Deposition (aka The Delphos Case) that was denied Publication by Scientific Journals — but it’s a relatively succinct reiteration of the hallmark timidity that characterizes — or more aptly, impedes — America’s learning curve into terra incognita. First, Erol Faruk has what exclusive groups like to call standing. He has a PhD in chemistry, worked research posts at Oxford and Nottingham universities, and became a development chemist at the corporation that became GlaxoSmithKline Pharmaceuticals. He has published peer-reviewed papers in arcane industry journals such as Helvetica Chimica Act, and The Journal of Antibiotics. He holds several formula patents. He speaks the language. Years ago, Faruk got interested in the 1971 Delphos, Kan., UFO case. No need to rehash the whole thing here, you can read all about it online, but what sucked him in was the ring of glowing soil it left behind. The family took pictures moments after the UFO took off, local media and law enforcement converged on the scene, and the ring scars lingered long afterwards. Fungal growth was the chief suspect at the top of the conventional explanations list, but it couldn’t account for the temporary blindness alleged by one witness, nor the numbing sensation reported by another who touched the glowing earth when it was still fresh. Faruk, years later, subjected several grams of affected soil to chemical analysis and discovered some puzzling behaviors in the sample compounds, including an apparent paradox in water soluble and water repellent properties. Most intriguing to him was how, as he would later write, the UFO “appears to have contained within its periphery an aqueous solution of an unstable compound whose likely sole function would be light emission.” Many UFOs are reported to glow. Maybe these trace effects held implications above and beyond this single event. Faruk’s research was published in the Journal of UFO Studies in 1989. Analytical chemist Phyllis Budinger later weighed in with her own study. Budinger interpreted some of Faruk's findings differently, but she also discovered complexities that he had missed. JUFOS published Budinger's work in 2002. Their combined efforts vanished with little comment. Faruk figured maybe that was because they were circulated in narrow-niche publications, and that it needed more eyes. So he decided to approach mainstream science journals, starting with Nature, the bible, in 2012. Maybe the exercise was doomed from the beginning, given the title of his paper — “The search for signs of extraterrestrial intelligence on earth; strong chemical and physical evidence for the existence of an unconventional luminescent aircraft (commonly called a UFO) observed by multiple witnesses at a farm in Delphos, Kansas, USA.” Ugh, that acronym again. But this is where things get interesting. Ouch. And without even reading it. 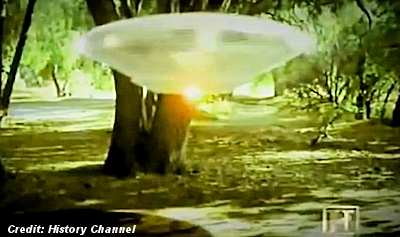 Faruk would later discover JBIS had run yet another UFO article — alien abductions, actually — in 2010. JBIS declined to respond to Faruk's subsequent appeals for additional discourse. "The Science Behind UFOs" – Stanton Friedman Lambastes Phil Plait & Astronomy Magazine in Open Letter!